Ngrams, Word Frequencies, and the Neutral Model. York St John University’s Linguistics Society, York St John University, March 2019. Total Systemic Failure? Invited talk at the Institute of Advanced Studies in Humanities, University of Edinburgh, March 10th 2018. Obfuscated democracy? Chelsea Manning and the politics of knowledge curation. With Dr Sarah Hughes. Workshop on Secrecy & Methods, Follow Project, October 19-20, 2017. Crypto Wars 2.0: This time it’s (not) different. Oxford University, May 2017. Vectorising the Human. Living with algorithms (invited talk), Royal Holloway, June 2016. AI and the Technology of Organisational Surveillance. Philip Garnett, STS4Cities Workshop, Sheffield University, March 2019. Debating Banking in Britain: The Colwyn Committee, 1918. Mark Billings and Philip Garnett, Business History Conference, Baltimore, April 2018. There but by the Grace of States? Dr Philip Garnett, AAG2018, New Orleans, April 2018. The System vs Donald Trump. Dr Philip Garnett, LAEMOS, Buenos Aires, March 2018. Human-Computer Decision Making. Dr Philip Garnett, 36th International Labour Process Conference, Buenos Aires, March 2018. Hillards Not for Sale: “…Fisty Cuffs in the City”. Dr Philip Garnett, Dr Simon Mollan, Benjamin Richards. British Academic of Management, Warwick, 2017. Hillards Not for Sale: “…Fisty Cuffs in the City”. Dr Philip Garnett, Dr Simon Mollan, Benjamin Richards. MHRG, Manchester, 2017. Amalgamation and Survival in Lancashire Banking. Mark Billings, Simon Mollan, , and Philip Garnett. Annual Economic and Business History Society Conference, 2017. Amalgamation and Survival in Lancashire Banking. Mark Billings, Philip Garnett, Simon Mollan. Association of Business Historians, 2017. Amalgamation and Survival in Lancashire Banking. Mark Billings, Philip Garnett, and Simon Mollan. Business History Conference, Denver, 2017. Vectorising the Human 2.0: Algorithmic Classification of People in High Dimensional Space. Philip Garnett. AAG, Boston, 2017. Finance and Security – a shared technology of discrimination? Philip Garnett, Royal Geographical Society Annual Conference, London, September 2016. Chasing Rainbows: A search for transparency in the use and design of security and financial algorithms. IAMCR Pre-conference, Surveillance and Security in the Age of Algorithmic Communication, Leicester, July 2016. Access Obfuscation and Soft Denial, Management History Research Group annual meeting, Sheffield, July 2016. Vectorising the Human. Living with algorithms (invited talk), June 2016. The Hillards-Files. Philip Garnett, Simon Mollan. Economic and Business History Conference, Montreal, May 2016. Vectorising the Human. Philip Garnett. Association of American Geographers, San Francisco, March-April 2016. Past and Future Data: The New Hillards-Files. Philip Garnett, Simon Mollan. MOHRG Winter School, University of York, December 2015. Total Systemic Failure. Philip Garnett. Royal Geographical Society Conference, Exeter, September 2015. Mining for Networks. Philip Garnett, Simon Mollan, Kevin Tennet, Chris Corker, Matthew Hollow and Katherine Newling. NetSci 2105, Berkeley, US, June 2015. Hillards, Philip Garnett & Simon Mollan, Management History Working Group 2105, University of York, Summer 2015. Connections and comparisons between British banking and international mining firms, 1900-78 – preliminary findings. Simon Mollan & Philip Garnett (presenter), Economic History Society Annual Conference, University of Wolverhampton, March 2015. Language Evolution in Management Studies. Philip Garnett, Timothy Clark, Mike Wright. Management History Research Group, London, July 2014. The Language of Management: a longitudinal study of word usage in leading management journals from 1960. Philip Garnett, Timothy Clark, Mike Wright. York University, July 2014. Complex Beyond Regulation. Financial Crime, Corruption and the Global Financial Crisis: What is the role of regulation? Philip Garnett, Global Policy Journal and Durham University, June 2014. Bursting a Bubble: Abstract Banking Demographics to Understand Tipping Points? CoSMoS Satellite, UCNC13, Milan, Italy, July 2013. The Language of Management: a longitudinal study of word usage in leading management journals from 1960. 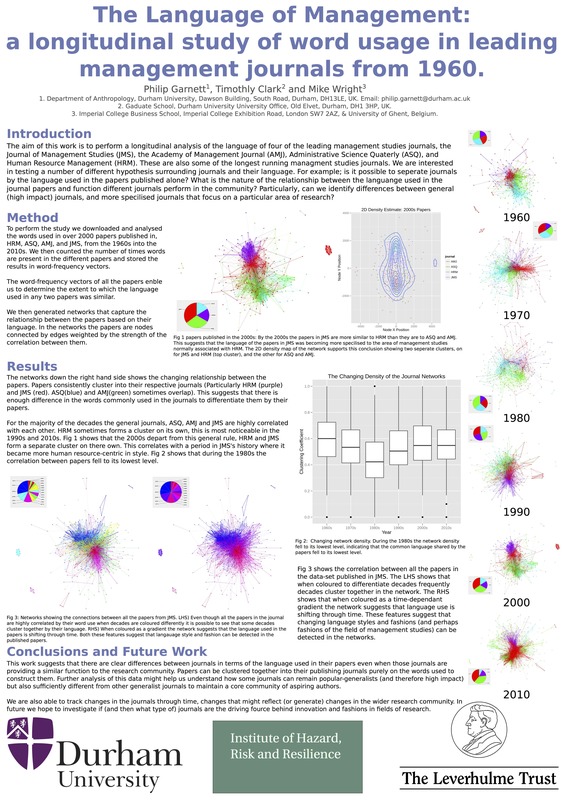 Poster, NetSci13, Copenhagen, Denmark, June 2013. Agent-based Modelling of the Emergence of large financial organisations. Durham University and Kyoto University Symposium, Kyoto, December 2012. Agent-based Modelling of the Emergence of the UK Banking Sector. ECCS’12 Complexity in the Real World workshop. Brussels, September 2012. Going Around Again: Modelling Standing Ovations with Flexible Agent-based Simulation Framework. UCNC’12 CoSMoS workshop. University of Orleans, September 2012. A population analysis and Simulation of British banking over time. Derby, 2012. Modelling Audience Behaviour. Tipping Points WP4 Launch Event, Durham 2012. A Population Analysis of British Banking Over Time. New Business History, York 2012. Using the CoSMoS Process to Enhance an Executable Model of Auxin Transport Canalisation. Alife (CoSMoS Satellite Workshop), Odense 2010. Agent-Based Modelling of Auxin Transport Canalisation. University of York Biology Department Graduate Conference, York 2010 (Received K M Stott Prize). Agent Based Modelling of Auxin Transport Canalisation. ACPD09, Prague, 2009. Towards an Executable Model of Auxin Transport Canalisation. CoSMoS Workshop, York, 2008. Modelling of Shoot Branching: Auxin Transport Canalisation. Auxin Transport Workshop, Nottingham, 2008. Integrative Hybrid Modelling of Plant Shoot Branching: Auxin Transport Canalisation. FSPM07, New Zealand, 2007.